Amritsar (ਅੰਮ੍ਰਿਤਸਰ) is a city in the state of Punjab, India. It is considered holy in the Sikh religion. The name Amritsar name derives from the pool around the Golden Temple (aka Harmandir Sahib) and means "holy pool of nectar" (Amrit elixir; Sar, short for sarovar which means "lake"). Amritsar is one of the largest cities in the Indian state of Punjab and is the spiritual and cultural centre of the Sikh religion. Sikhs are rightfully very proud of the city and their very beautiful and unique Gurdwara (place of worship), the Golden Temple. Amritsar is today a major pilgrimage centre for Sikhs and a tourism centre for anyone. Amritsar is known mainly for its Golden Temple which was initiated by Guru Ram Das, the fourth Sikh Guru and the founder of the city, and completed in 1601 by his successor Guru Arjan Dev Ji. The Jallianwala Bagh massacre or Amritsar massacre occurred in 1919. The area where this occurred was a large, open square but walled in on all sides. British troops opened fire on a crowd of demonstrators, and a large number were killed — the British said 370 dead and 1,200 wounded but Indian sources say the total was well over 1,000 dead. Some of the victims were, in fact, demonstrating, protesting against the arrest of two political activists, while others were gathered to celebrate the traditional festival of Baisakhi. Not all died directly due to British fire; many were trampled in the stampede to escape and others died diving down a well to avoid the bullets. Today the well is a rather grisly tourist attraction and bullet holes are still visible on walls around the area. The massacre news spread quickly all over the country caused widespread outrage and additional demonstrations as it stunned the entire sub-continent. Eventually, the public lost faith in the British colonial government and subsequently, this massacre initiated the "Non-cooperation movement" led by the father of the nation, Mahatma Gandhi. It is considered a significant phase of the Indian independence movement from British rule. It also had a tremendous effect in the UK, with many of the more liberal British appalled by it while others thought it necessary. A commission investigated and concluded that "General Dyer thought he had crushed the rebellion and Sir Michael O'Dwyer was of the same view, ... (but) there was no rebellion which required to be crushed." Dyer was in command on the spot and O'Dwyer the provincial governor. During the partition of the Indian Subcontinent in 1947, the Punjab region was divided between India and Pakistan near Amritsar. Pakistan wanted to annexe Amritsar due to its close proximity with Lahore and 50% Muslim population; however, the city remained inside Indian territory. Similarly, India wanted to annexe Lahore. Both of the cities experienced some of the worst communal riots during the partition. Mass evacuations were made both in Amritsar and in Lahore. Hence, the demographics of both the cities were changed following the partition, significantly altering the culture and affecting the political, economic and social environment of the cities. In June 1984, an Indian military operation ordered by then Prime Minister of India, Indira Gandhi, was launched in the city to remove a few hundred Sikh militants who had taken control of the Golden Temple compound. After a few hundred people were killed during the 5-day siege, thousands of civilians were killed throughout the country in the aftermath. The best time to visit Amritsar is during winter, especially between October and March. 31.7072974.806671 Raja Sansi International Airport (Sri Guru Ram Dass Jee International Airport ATQ IATA) (About 11 km northwest from the city centre. ), ☎ +91 183 2214166, fax: +91 183 2214358, e-mail: apdasr@aai.aero. It's one of the modern airports in India and quite adequate if not exactly exciting. Most flights are to Delhi, an hour away, but there are an increasing number of international connections: Air India flies to Birmingham and there are also a surprising number of flights to Central Asia (Turkmenistan and Uzbekistan). Qatar Airways now flies to Doha. Taxi drivers wait outside the arrivals gate for visitors. For a trip into town, even the prepaid taxi can be bargained down with the drivers to ₹300 from initially ridiculous prices of ₹550 a person (as of March 2014) before you pay, but there is a significant dearth of official taxis or even auto-rickshaws, so prepare for a hard time. Uber is not available (2017), however OLA is available. OLA charges around ₹350 and it slaps a ₹100 charge for parking which is not apparent while booking. This charge is applied both during airport pickup and drop off. Also, there is a zone around the Golden Temple in which automotive vehicles are prohibited. Though not stringently applied, the streets do get very narrow, and you will probably end up making the last ten minutes of the trip on foot. The cheapest way to and from the airport is by local bus. Take the bus to Ajnala (stand 19 in the city bus stand) and tell the conductor that you go to the airport. The bus costs ₹15 (December 2018). The bus will drop you in the main road, about 1 km away from the airport. You could walk this in about 15 minutes or take a rickshaw or auto from there. The way back should be the same, just walk to the main road and hail down any bus going into the city. If you are staying near the Golden Temple a shared electric auto to the bus stand is ₹10. 31.633374.86722 Amritsar Junction Railway Station (IR station code : ASR) (North of Golen Temple Complex). An important railway station that is well connected to major cities in India through daily trains. Trains can be booked online, at the train station. 31.6185774.878273 Train Booking Office, Golden Temple Unit, Baba Attal Road (In the Golden Temple Complex). The most convenient place to book a ticket. Book your return train ticket as soon as you arrive in Amritsar, or before if you know the exact date, as trains are often heavily booked. Long-distance taxis are available from most places. It takes around 6–7 hours from New Delhi via NH-1. Amritsar is well-connected by bus to most major cities and the northern areas within a days drive. Pathankot is about 2½ hours away and about 100 km away, Jalandhar is about 80 km from here, Kapurthala is about 65 km from here and there are daily direct buses to New Delhi, Jammu, Katra, Chandigarh, Dharamsala (once daily, ~6 hours), etc. You can find Volvo buses from Chandigarh, Delhi and Katra to Amritsar. If coming from Wagah at the Pakistani border, take a cycle-rickshaw (₹15, 3 km) to the Attari station, where you can catch a local bus to Amritsar (₹20, 25 km). Another possibility is to hop on one of the tourist buses which are going directly from the border back to Amritsar city centre daily after sunset. Taxis also use this route and charge around ₹200 for the entire journey. 31.62174.87815 Tourist Information Centre, Golden Temple, ☎ +91 78 376 13200 (Deepak Kumar mobil), e-mail: todamritsar@gmail.com. 31.6044174.573796 Tourism Office of Punjab State, ICP, Attari Border, ☎ +91 98 767 88 683, e-mail: dto.ankur@gmail.com. 31.633974.86767 Punjab Tourism Office, Railway Station, Outer Gate, Railway Station (opposite Irrigation Department), ☎ +91 78 376 13 500, e-mail: dtoasra@gmail.com. City public bus system introduced. There is a free bus service from the train station to the golden temple run by Golden Temple trust. It drops you right at the accommodation booking office of the Golden Temple where you can get double bed room for ₹1000 per day. An auto-rickshaw from the train station to the temple should cost around ₹20, while a cycle-rickshaw will cost about ₹30. Electric rickshaw between the Golden Temple area and the bus stand are ₹10. If you have your own car to get around Amritsar then simply confirm the directions with a local guide. In case you don't have your own car then there are several travel agencies that can offer you the car of your choice. Renting a car is less time-consuming and affordable. Experienced car drivers know all the shortcuts within the city and will take you to the best hotel or restaurant. Never pay the entire fare to the car agent in advance and don't leave expensive luggage in your car whenever you are visiting a site. 31.6195374.877091 Golden Temple Complex (Harmandir Sahib Complex), Golden Temple Road, Atta Mandi (Centre, One km south of Railway Station). The complex is open from 06:00 until 02:00, and is worth visiting twice: once during the day, once at night, when it's beautifully lit up.. This is the main attraction in the city, and the most important religious place to the Sikhs. It's a stunning complex, and always full of thousands of pilgrims from all over India, excited to be at a place that they usually only see on television. The excitement to be here is infectious, and many people will be more than happy to tell you all about their religion and customs, and show you around the temple. As you arrive near the complex, you will more likely than not be accosted by hawkers trying to sell you bandannas to cover your head. It's not a bad souvenir for ₹10, but there's also a big barrel of free ones to choose from at the entrance. Head covering is mandatory for all. 31.6187174.878222 Akal Takht (The Timeless) (opposite the Harmandir Sahib, and the marbled Darshni Deorhi). This is where the highest council of Sikhs sits and deliberates. At night, the Guru Granth Sahib is taken to the Akal Takht. 31.6194574.876543 Amrit Sarovar. The giant pool of water that surrounds and reflects the Golden Temple. Sections (marked off by ropes) are set aside for (male) pilgrims wishing to bathe. 31.6206774.877124 Central Sikh Museum (2nd floor, entrance on the right side of the main entrance when looking from the pool). Devoted to large gallery of paintings, mostly showing the gruesome ways countless Sikhs have been martyred, and various items from the gurus. Free. 31.6199874.876555 Harmandir Sahib (Sri Darbar Sahib). This is the Golden Temple itself, floating above the Amrit Sarovar, housing the sacred Adi Granth scripture which is recited out loud during the day. This is the most crowded point, accessible by a bridge from the edge of the pool, and entry here is regulated by traditionally dressed Sikh guards. It's a 2-storey structure where Sikh saints are seated on each floor. 31.6178674.876596 Kaulsar Sarovar (Kaulsar Sacred PÍools) (SW part of the Complex). This is one of five sarovars in the city. This sarovar is in honor of Mata Kaulan, a Muslim woman, who was taken into care by the sixth Sikh Guru, Guru Hargobind on instructions of Mian Mir, a close friend of the Sikh Gurus and a pious and wise Muslim pir. All Sikhs are encouraged in their lives to do volunteer services at any gurdwara or in the greater society, and everyone you see working here is fulfilling that duty. It's likely possible that you can join in if you feel so inclined: you could enquire by asking the people outside peeling vegetables, or those washing dishes. 31.6182774.875947 Gurdwara Mata Kaulan Sahib Ji (on the north shore of Kaulsar Sarovar). 31.6182774.876958 Manji Sahib Hall (East of Kaulsar Pool, Opposite Sri Guru Ram Das Langar Hall). 31.6189274.8784910 Sarai Shri Guru Ramdass Ji (Shri Guru Ram Das Sarai) (S of Amrit Sarovar). Built in 1931. Lodging place for pilgrims in 228 rooms. 31.618174.8777512 Sri Guru Nanak Dev Niwas (West of Guru Arjun Dev Niwas). This building houses sectarian offices of the different departments of SGPC and provide lodging facilities for pilgrims. Twenty rooms for pilgrims. 31.624674.87714 Gurudwara Santokh Sar, Golden Temple Out Rd (near Subhash Park). 31.627274.867415 Durgiana Temple (Lakshmi Narayan Temple), Basant Avenue, Gole Bagh (near the Lohgarh Gate). The temple is enshrined with Goddess Durga. Daily rituals devoted to Durga Ma is performed in here. A dome and a tank are the prime possession of Durgiana Temple. Apart from Durga Devi, Durgiana Temple is also famous for Lord Krishna and Lord Vishnu. Believers whom devotees of these Goddess Lakshmi and Narayan also visit the shrine to gather the blessings. 31.608674.892516 Gurdwara Toot Sahib, Sultanvind Area, Jaspal Nagar (3 blocks south from Sultanwind Rd. ), ☎ +91 70095 44833. Gurdwara Shib of Guru Hargobind Sahib Ji. 31.631374.847417 Gurudwara Pipli Sahib, Guru Arjun Dev Nagar quarter, Merchant Rd. (west one km of R.S.). 31.611974.896918 Gurudwara Baba Budha Sahib (Gurudwara Sahib - Gobind Nagar), one block north from Sultanwind Rd. (southeast ~2 km of Golden temple). Jama Masjid Khairuddin. It was built in 1976 by freedomfighter Mohammed Khairuddin. This is a mosque where Tootie-e-Hind, Shah Attaullah Bukhari protested against the British Rule. 31.63774.860819 Mata Temple (Lal Mata Mandir), Rani Ka Bagh area (800 meters northwest of the railway station). This is a cave labyrinth-like Hindu temple devoted to the female saint Lal Devi. Traditionally, women wishing to become pregnant come here to pray. The roundabout path to the main temple passes through low tunnels, caves full of ankle-deep water, inclined walkways, and mirrored hallways that make the experience seem more like a fun house than a place of worship. The colours, wide variety of deities and elaborate mirrored image make this a psychedelically unique temple. Highly recommended! This is called Sheesh Mahal, and some people also seem to call it "Lal Dev." 31.6182474.87637520 Baba Atal Rai Tower, Bazar Chure Wala, Papraha Wala Bazar, Katra Ahluwalia. 31.631674.874121 Gandhi Gate, Hall Road, Katra Ahluwalia (east 500 m from R.S.). 31.620174.880622 Jallianwala Bagh (A 5-minute walk east from the Golden Temple,). Daily 06:00-21:00 in the summer and 07:00-20:00 in the winter.. The site of the 1919 Amritsar massacre, turned into a park memorial. On April 13 of that year, British Indian Army soldiers opened fire on an unarmed gathering of men, women and children. The firing lasted about 10 minutes and 1650 rounds were fired, killing 1579 people. A memorial was built on the site and inaugurated by the then-President of India, Rajendra Prasad, on 13 April 1961. The bullet holes can be seen on the walls and adjoining buildings. The well into which many people jumped and drowned attempting to save themselves from the hail of bullets is also a protected monument inside the park. The area near the entrance is only for pedestrians with shops and restaurants. Free. 31.6272774.8600523 Gobindgarh Fort (Gobindgarh Fort, Bhangian Da Quila), Old Cantt Rd, Vijay Chowk, (Half km south of the railway station), ☎ +91 183 521 7666, e-mail: info@fortgobindgarh.com. Daily 10:00-22:00. A large 1760 fort that is being turned into a tourist spot with several museums and performances. The fort was built of bricks and lime by Gujjar Singh Bhangi and armed with 25 cannons. In 19th century it was conquered and enhanced by Maharaja Ranjit Singh, then captured by the British and also used by the Indian army. After restoration it was opened in 2017 to the wide public in a form of something between a museum and amusement park. 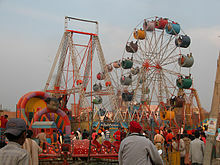 Among the attractions there is a central stage with live performances; several rooms showing Punjabi clothing, coins and warfare; multimedia shows such as Sher-e-Punjab, a camel ride and a few restaurants and shops. ₹100-800. 31.622974.897624 Maharaja Ranjit Singh's Statue (Statue of Maharaja Jassa Singh Ramgarhia). 31.640374.879125 Ram Bagh (Company Bagh) (Near Lawrence Road). Tu-Su 10:00-17:00. This is a beautiful garden. A tribute to Guru Ram Das, the founder of the city. Famed as the summer palace of the Maharaja Ranjit Singh (Ranjit Singh Panorama? ), it has now been converted into a museum which exhibits weapons from Mughal times to portraits of ruling houses of Punjab and the replica of "Kohinoor" diamond. ₹10. 31.638374.879626 Maharaja Ranjith Singh Museum, Maharaja Ranjit Singh Bagh (Ram Bagh), Lawrence road (east of Punjab Lawn Tennis Association (PLTA) Tennis Court). 31.640474.87827 Statue of Netaji. Subhas Chandra Bose (Netaji) was an important leader in the Indian struggle for independence. He led the Indian National Army and formed the Provisional Government of Azad Hind in exile. 31.640474.876528 Summer Palace of Maharaja Ranjit Singh', Maharaja Ranjit Singh Nagar, Hasanpura Chowk (Ram Bagh park.). The palace houses a museum, exhibiting oil paintings, miniatures, coins and weapons from the Sikh period. In this park is the Maharaja Ranjit Singh Panorama, so ask, if you are at the right museum. Historical Banyan Tree (Shaheedi Bohr), At the northern boundary of Ram Bagh. 31.6152774.8811229 Sarovar Ramsar Sahib, Moni Chowk, Katra Ahluwalia (south one km from centre, next to Gurudwara Shahidan). Pool. 31.6257474.7761930 Statue of General Sham Singh Attariwala and India Gate. 31.451474.923931 Tarn Taran Sahib (Tarn Taran Gurudwara) (22 km southeast of the city, 600 m west of the train station). Mughal architectural style. There is a big holy tank and believed that the water of its has magical healing power. Amavas, or no moon day, is the most popular Feast, also Diwali, Baishakhi and the various Guru Parabs festivals held here. 30.2081174.9373832 Bathinda Fort and Qila Mubaraq (Hindi: ਬਠਿੰਡਾ), Near Fort street, Old City quarter, Bathinda (500 m east of Bathinda Junction Railway Station, about 180 km south of Amritsar). The Qila is one of the oldest and highest small brick monument. It also contains two gurudwaras as the tenth Sikh guru Gobind Singh visited the place. The fort was built in 1930. It was as the official residence of armed forces of Maharaja Bhupinder Singh of Patiala State. It has been converted into a four-star hotel. Other sights in/around the town: Rose Garden on four hectares (close to Thermal Plant), Zoological garden (10 km away), Chetak Park with a lake, Mazaar of Peer Haji Rattan a worship place including a mosque and a Sikh gurudwara.- Further afield: Lakhi Jungle (15 km away toward Muktsar). A forest having old Gurudwara enjoyed the touches of Shri Guru Nanak Dev. 31.3637675.1446234 Gurudwara Goindwal & Baoli Sahib (Samadhi of Guru Angad Dev Ji), Goindwal Sahib (about 45 km southeast from Amritsar). Located on western shore of Beas River, Northeast 30 km. It was the first centre of Sikhism, holds immense significance in reference to the Sikh pilgrimage sites. A popular pilgrimage destination for both Sikhs and Hindus. The entrance of place is well decorated with murals describing significant scenes of the Sikh history. The massive langar of the community kitchen provides food to a large number of visitors every day. Guru Amar Das Ji (the third Guru) established this place. There is a Baoli (well) with 84 steps leading down to it. The devout believe that by reciting Japji Sahib, the divine Word revealed to Guru Nanak Dev at each step after taking a bath in the Baoli. 31.1674.97335 Harike Bird Sanctuary (Hari-ke-Pattan), Harike village (South 54 km). Daily 09:00-17:00. The second largest bird sanctuary in India. Also a National Wetland & Wildlife Sanctuary. Hari-ke-Pattan is one of India's leading in-land sweet water fish market and home of varied wild life. 31.3940875.28663936 Mandir Mata Salani Ji, Khiranwali (SE 60 km away from Amritsar, north half km from Kapurthala - Khanpur Rd). 31.64774.56937 Pul Kanjari village (W 35 km away from Amritsar, north 6 km from Wagah Border). Maharaja Ranjit Singh had been staying here in a Baradari as and when he passed by with his troops. It has been declared as a World Heritage Site by the UNESCO. It is said that once when a young dancer was going to Maharaja's Baradari for a dance performance, her shoe slipped into the water channel. A bridge (pul) was especially constructed to take her shoe out and hence this place got its name. Here is also a temple, a mosque and a Gurudwara. Popular shopping place for locals. 31.685774.726538 Ram Tirth (Ram Tirath Temple), Chogawan Road , Kaler (West 11 km outside the city. Half km north of the main road). 05:00-09:00?. Consecrated by the appearance of Devi Sita, Ram Tirth was the birth place of the sons of King Rama. Making a special place in the holy scripts of ancient religions, the place was once the ashrama of saint Balmiki. The saint is believed to have scripted many of his sacred manuscripts at this place. A hut of Rishi Balmiki is still found at Ram Tirth where he once lived. After giving birth to Luv and Kush, Devi Sita used to stay at this place for a considerable period of time. The evidence of her stay still exists in the form a well which, it is believed, was dug by Hanuman. Devotees of King Rama and Devi Sita flock to this place every year to offer their prayers to the respected deities. As the locational position of the Ram Tirth is facilitated by easy accessibility, hence, the visitors conveniently reach this place of worship without any extra hassles. 31.605174.575639 Wagah Border, Attari, Punjab (28 km away from Amritsar, around 25 km from Lahore, Pakistan. From Amritsar, there are four options. One, take a tourist hop-on hop-off double-decker bus, leaving around 15:00 - the roundtrip costs ₹250, as of 2018. Two, take a bus to Attari town and then hire an auto/walk the rest. Three, hire an auto - charges would be at least ₹350. Four, take a shared taxi from the backside of the Golden Temple for about ₹80-₹100 per person. Make sure you check the vehicle before paying, offer a deposit and ask if you can pay the rest on your return. In all cases it's a 45-minute ride, so you should leave Amritsar by around 15:30.). The ceremony lasts for 45 minutes and is carried out before sunset. 16:15 is the time during winter and 16:45 during summer. The border gate is open from 10:00 to 16:00. However, the ceremony starts only after 16:00. So if you want to watch the ceremony, you have to reach the place not later than 15:00.. The Wagah international border is a post between India and Pakistan. The border place features a huge arch and has gates of both the countries, surrounded by two spacious amphitheaters on both sides. Since 1959, the border crossing has become famous for this ceremony, which includes the closing of international gates, a lot of nationalistic cheering, a Monty-Pythonesque silly walk, and the lowering of the flags of both the countries. The flag code of India mandates that the national flag shall be flown only from sunrise to sunset. The guards who perform are chosen carefully among those who have great height, ability to perform, and imposing stature. The crowd on weekends is heavy. No mobile phone service is available here. No covered bags are allowed, including ladies handbags or purses. There are stalls nearby, organized to buy food and bottled water. Seats are packed on weekends and public holidays- Once you reach there around 15:59, you will join a crowd of thousands of people who have also come for a glimpse of the ceremony. Before the actual event, you need to stand in organised crowd (don't bother queuing) in the heat and dust for around 2 hours and then one hour before the ceremony, get let in to fight your way from one check post to another. Keep to the left side and follow the signs to the VIP area once you see the grandstands. There are no sheds, so it gets pretty hot and sweaty unless you go in the winters. Be prepared for that. Not everyone can manage it. If you have a small baby with you, twice before visiting. Security at the border is very high, you'll be searched twice, and water and cigarettes confiscated. When you're let in, there are separate queues for men and women, and Indian women are kept separate for the women section. Foreigners of both sexes are kept together in the same area after going through the separated security lines. They now have a reserved section for foreign tourists so make sure you bring your passport with you so that you can skip the queue and get the best seats available. Also, remember not to bring any bags with you because you will not be allowed in with them. Cameras are allowed. Free. Amritsar Heritage Walk. Despite visiting Amritsar and Golden temple several times, visitors find Heritage Walk experience extremely enjoyable and informative. Old City Shopping. As you move through narrow path of old city and some other heritage buildings, you can see stalls selling everything from jootis to roasted sweet potatoes. Almost every Sikh at the temple will be willing to talk to you about the temple and their religion and culture. Go there with an open mind and you'll leave with a smiling heart. There are bustling bazaars with a huge variety from embroidered phulkari dupattas to famous papad wariyan. The markets offer a wide range of products like carpets, bangles, shawls and woolen textiles and Punjabi juttis (traditional footwear). Sikh symbols and religious paraphernalia like khandas, Karas (Sikh religious bangle), swords, daggers etc. from the shops close to the Golden Temple. Clock tower (since 1930) (Balmukand Kailash nath), new misri bazar, near golden temple (2-3 mins walk from golden temple), ☎ +91 9988367620. The Brothers or Bharavan the Dhaba (near the Golden Temple). Serves traditional food or Chinese, continental at affordable prices. However, the food and service drops during peak times like weekends. 31.6442374.884451 Charming Chicken, Opp. Nari Niketan, Majitha Road (From bus stand direct auto service available), ☎ +91 9814096207. 17:00-23:00. Established in 1958. Very popular family restaurant, particularly for butter chicken with naan. No alcohol is permitted. 4£. The Golden Temple Langar has a dining hall (langar) serving free basic meals to all. Plates and spoons are handed out near the entrance, then follow the crowds inside and take the next vacant spot in one of the rows on the floor. Servers come by with large buckets of dal, chapatis and rice. Make sure to finish everything on your plate (wasting food isn't an option here) then take it outside to volunteers at the washing area. It's inside the complex which means no shoes and cover your head. At the exit, there is a donation box, in case you want to voluntarily donate for the cause of free meals. Open 24h a day. Kesar da Dhaba (Located near the Golden Temple). It offers good Punjabi food made in pure ghee. Daal Makhni is worth trying. Don't forget to try a glass of Lassi after a heavy meal. Moolchand Fish Shop, Off of GT Road near Tourist Guesthouse. (Find the Christchurch Cathedral (large red-and-green church, pretty conspicuous!) and keep walking, away from GT road. In about 2 minutes, you'll see a little shop selling fish.). Open 08.00-23.00. This tiny place is the definition of hole-in-the wall. If it looks like it has been there for 50 years, it's because it has! They'll weigh out your fish based on how much you want to pay, fry it, put some delicious spices on it, and serve it with spicy green chutney and raw onions. A little hard to find, but worth it. About ₹50 for a good-sized piece of fish, ₹70 for a serving of chicken..
My Kind of Place. Offers fast food such as pizza, burgers, and chips. It offers Chinese & Continental food also. Neelam's (A few doors down from New Punjabi Rasoi). Offers pizza and other basics. Meals from ₹30..
New Punjabi Rasoi (Around the corner from the temple). It's one of the most popular restaurants in town and serves up great Indian food including tasty masala dosas. Meals ~ ₹40-60.. There are very few decent non-veg restaruarnts and cafes near the temple complex. Lassi is a popular and traditional yogurt-based drink which originates in the Punjab region. It is made by blending yogurt with water and Indian spices. Traditional lassi (also known as salted lassi, or, simply lassi) is a savoury drink sometimes flavoured with ground roasted cumin while sweet lassi, on the other hand, is blended with sugar or fruits instead of spices. Bar One, Comfort Inn GSK Hotel Amritsar, 110, Albert Road. Empire Lounge, Welcom heritage Ranjits Svaasa, 47a, Mall Road Area. Glassy Junction at Surya Residency, Dist. Shopping Complex Ranjit Avenue. Nimos Restaurant and Bar, Green Avenue, Amritsar. The Golden Temple (In Guru Ram Das Ji Niwas, behind the temple). Offers free accommodation to pilgrims and tourists in very basic dorms or 3-bed rooms. You should also remain quiet and respectful of the surroundings, keeping in mind that this is a holy place of pilgrimage more than a tourist attraction. Alcohol and smoking are strictly forbidden, not only within the temple complex but anywhere within sight of the temple complex. If you can handle that, then this is arguably the best place to stay - watching people go about their routine, talking to the pilgrims, and absorbing the gorgeous atmosphere. Put your donations in the donation box near the entrance to Ram Das Ji Niwas, as opposed to the guards who will ask you for it when checking out. While free, donations are expected (₹50-100 minimum per person per night is appropriate). 31.6335674.876411 Tourist Guesthouse, 1355 GT Road (Near Bhandari Bridge, One km east of Amritsar Junction Station), ☎ +91 183 255 3830, +91 93 56003219 (Mobile). A popular backpackers choice near the railway station. A very nice place with a decent restaurant and friendly owners. About 25 minutes walking distance to the Golden Temple. ₹250-₹400. Hotel Astoria, Queens Road (North of the Railway Station), ☎ +91 183 2401222. Rooms : 28. Room Rate : ₹500-1500. 31.619674.8812 Hotel Golden Heritage, Bazar Sarai Guru Ram Dass (Near to Jallianwala Bagh), ☎ +91 183 5070628. Check-in: 12:00, check-out: 12:00. Rooms : 35 Rooms : ₹900-1600. 31.625274.88433 Hotel Sita Continental, Sheran Wala Gat (2½ km from Railway Station, 500 m from Bus Stand. Ten minutes walk from Golden Temple, Golden Temple Road,and Golden Temple Way corner), ☎ +91 183 5002840, +91 977 91-09190 (Mobile: S. Surinder Pal Singh), e-mail: sita_continental@yahoo.co.in. Its basic, new and clean. Standard Double/ Triple with Bathroom ₹550/₹650, Semi-Deluxe A/c Double/ Triple with Bathroom and TV ₹650/₹750, Deluxe Room A/c Double/ Triple with Bathroom and TV ₹850/₹1050. (2014). 31.6199874.880684 Hotel Sita Niwas, 61, Sita Niwas Road (near the eastern corner of the golden temple. The Hotel Sita Newas next door offering rooms from ₹1000, so ask where the other one is if the price seems high. ), ☎ +91 183 2543092, +91 183 5064841, +91 98154-83755 (Mobile), e-mail: sitaniwas@yahoo.co.in. Check-in: 12:00, check-out: Midday. Good and relatively cheap (₹80) food in their restaurant. They also organise shared jeeps to the Atari border crossing for ₹250 return. Doubles Standard / Semi-Deluxe / Deluxe Room ₹600/₹700/₹900 With Breakfast : ₹1000. - Triple Bed Semi-Deluxe / Deluxe / Deluxe Air-con Room ₹800/₹900/₹1000. With Breakfast: ₹1200 (2014). 31.635774.87285 Hotel Sukhman International, Queen's Road, Hotel Lane, ☎ +91 183 2222077, +91 98 141-07505, +91 94 175-51515 (Mobile), e-mail: info@hotelamritsarsukhman.com. Rooms : 25 Comfort single ₹1300-1500, deluxe double ₹1900-2300, super deluxe double ₹2200-2600 (2014). 31.636174.87396 Hotel Veenus International, 3, Queens Road (East of R.S. ), ☎ +91 183 2566239, +91 183 2566610, +91 183 5081560, +91 98 55967487, +91 98 55447487, +91 98 14029487 (Mobile), fax: +91 183-2220320, e-mail: hotelveenus@hotelveenus.com. Rooms: 25. Deluxe / Super Deluxe / Family triple / Family four beds Room: ₹1000/₹1100/₹1500/₹1700. 31.62274.876877 Temple View, Golden Temple Road, Atta Mandi, Katra Ahluwalia (Northwest of Jallianwala Bagh), ☎ +91 183 5014555, +91 183 5014666, e-mail: hoteltempleview@yahoo.com. A small two star hotel with eight rooms. Services: free parking space, 24-hr room service, Free wi-fi, travel assistance, laundry. Double ₹1250 (2015). Hotel Sakhi Inn, 2845/3-Chowk Pragdass, Galiara Corner (Near Sarai Guru Ramdas), ☎ +91 183 2454394, +91 98 88133989, e-mail: hotelsakhiinn@gmail.com. Check-in: 12:00, check-out: 12:00. Eleven rooms. Air Conditioner, Room service, Double Deluxe/ Super Deluxe /Family Suite ₹1,350/₹1,650/₹1,850 (2014). 31.6192174.879228 Hotel Grace, 35, Braham Buta Market (Near to Jallianwala Bagh), ☎ +91 183 2559355, e-mail: info@hotelgrace.net. Check-out: 12:00. Two star hotel. Sixteen double bedrooms. Semi-Deluxe / Deluxe (Non aircon) ₹1350/₹1600, Semi-Deluxe / Deluxe (aircon) ₹1800/₹2100 all tax incl. Extra Bed ₹230 (2014). 31.63674.87449 Hotel Queensland, 3, Queens Road (East of R.S. ), ☎ +91 40 4006 8050, e-mail: admin@chobs.in. Rooms : 41 ₹1500-1800. 31.63474.868110 Grand Hotel, Queens Road (Opposite Railway Station. Walk out from platform no. 1 exit, cross the road to your right and you will reach it in 2 min by walk. ), ☎ +91 183 2562424, +91 183 2562977, e-mail: reach.grandhotel@gmail.com. Rooms: 33 Standard / Semi-Deluxe / Deluxe ₹1350/₹1680/₹1900, all tax incl. (2014) , plus Breakfast ₹175. Avaas Lifestyle Hotel, 12, Lawrence Road, ☎ +91 183 2400601, +91 183 2400602, +91 183 2400603, fax: +91 183 5097777, e-mail: info@avaas.in. Three star.Rooms: 31 Room Rate : ₹2500-₹5000. Hotel la Cascade, 52, R.B. Parkash Chand Rd (opposite Police Line, near Lawrence Rd), ☎ +91 40 4006 8050, +91 9989 877 188, e-mail: admin@chobs.in. Check-in: 14:00, check-out: 11:00. Fully air-conditioned hotel with 18 rooms. ₹2200-4900. 31.6215274.8784511 Hotel City Heart and Café Heart, Golden Temple Rd, Jallan Wala Bagh (near Golden Temple, opposite Jallianwala Bagh, 2 km of Bus Stand), ☎ +91 183 2545186, +91 183 2554511, +91 183 2292282, +91 98 55545151 (Mobile), e-mail: info@hotelcityheartamritsar.com. Offers views of Golden Temple and the city. Three star. 35 rooms. Delux / Super Luxury/ Inter Connected /Suite Rooms ₹2050/₹3100/₹6300/₹6100, Extra Bed ₹550 (2014). 31.6205374.8779312 Hotel CJ International, Langar Hall Building (opposite Golden Temple), ☎ +91 183 254 3478, +91 183 2543478, +91 98 76444000 (Mobile), fax: +91 183-2535677. A newer hotel and with views of the Golden Temple. They have beautiful splurge higher end rooms beautifully designed & created. Wifi enabled lobby & restaurant. ₹1700-4000. Comfort Inn Alstonia, SCO - 111, District Shopping Centre, Ranjit Avenue (near Passport Office), ☎ +91 183 5077777, +91 9779633001, e-mail: gm@comfortinnalstonia.com. Three star,Rooms: 57 Room Rate: ₹2500-4000. Hotel Darbar View, Bazar Mai Sewan (Near Golden Temple), ☎ +91 183 5059393, e-mail: info@hoteldarbarview.com. Check-out: 12:00. Two-star hotel with 19 rooms. Deluxe/super deluxe single ₹1650/₹2150, deluxe/super deluxe double ₹1850/₹2450. 31.63774.868513 Hotel Fairway, 51, Court Road (North one km from Railway Station), ☎ +91 9988506364, +91 9872405566. Three star hotel. Rooms: 27 ₹2400-₹4200. Hotel Lawrence, 6, Lawrence Road, ☎ +91 183 2400105, +91 183 2400106, e-mail: lawrenceasr@rediffmail.com. 3-star with 24 right. ₹2700-4500. Hotel Heritage Inn Amritsar, 1234 - Baba Attal Road, Besides Golden Temple, ☎ +91 183 2536073, +91 183 2536074, +91 97 7914 6599, +91 98 76631047, e-mail: info@hotelheritageinnamritsar.com. Three-star hotel. Rooms are well furnished and decorated. ₹1500-3500. 31.617974.880714 Hotel Holy City, Chowk Paraag Dass (Near Sarai Guru Ram Dass, South of Golden temple), ☎ +91 183 5068111, +91 98 888-24316, +91 98 152-27117, +91 99155-89777, e-mail: mail@hotelholycity.co.in. Rooms : 24, Central air-condition, foreign exchange, travel desk, 24 hours room service, car rental, laundry service, Wi-Fi in lobby. ₹1600-2900. 31.635774.873615 Hotel Hong Kong Inn, Queens Road (Crystal Chowk), Hotel Lane, opposite Country Inn Hotel (east of railway station), ☎ +91 183 5099905, +91 183 5099906, +91 9216968878, e-mail: hotelhongkonginn@yahoo.com. Rooms: 47 ₹2000-4000. Humble UNA Smart Amritsar, 18, Krishna Nagar, Lawrence Road, ☎ +91 98 11350523, +91 98 99396307, e-mail: sales@unahotels.in. Four-star hotel with 42 rooms. Rooms: ₹2800-5000. Hotel Ishan Villa, Verka-Majitha Bypass, Service Lane, ☎ +91 183-2263782, +91 98 14154054, e-mail: hotelishanvilla@rediffmail.com. ₹2700-5800. 31.6202174.8783116 Hotel Indus, 211/3, Opp. Langar Hall Building (right opposite to Golden Temple. ), ☎ +91 183 2535900, +91 183 2535910, e-mail: hotelindus@yahoo.com. Sixteen rooms. ₹1800-2500. Hotel 42 The Mall, Mall Road, ☎ +91 183 5094242, +91 183 5003042, e-mail: info@hotel42amritsar.com. Luxury hotel. ₹2800-3900. Hotel Le Golden, Kucha Chatar Singh, Bazar Mai Sewan, Clock Tower Extension (Near to the Golden Temple Complex), ☎ +91 183 2558800, +91 183 5011000, fax: +91 183 5068000, e-mail: info@hotellegolden.com. Two-star hotel. Having view of the Golden Temple from room & restaurant. ₹1750 to ₹5550. Hotel Narula's Aurrum, Mall Road, ☎ +91 183-2222224, +91 9815396666, e-mail: narulainternational@yahoo.co.in. Four-star. 31 rooms. ₹2500-5000. 31.6219774.8795417 Hotel Robin, 2458/3 Niwaan Bazar, Near Jallianwla Bagh, Golden Temple Road (next to Hotel City Heart), ☎ +91 94 17240900. 24 rooms. ₹1600-₹3500. 31.6200674.8796918 Hotel Royal Inn, 49, Brahm Butta Market (near Sarai Guru Ram Das, opposite Punjab National Bank), ☎ +91 183 2551800, +91 183 2531800, +91 183 5061800, e-mail: info@hotelroyalinn.in. Rooms: 18. ₹1400-₹3500. 31.639474.866819 Hotel Royal Castle, 309, Albert Road (About 15 min N-NE from the Golden Temple, near to Court Rd. ), ☎ +91 183 2225562, +91 183 2225563, +91 183 2225564, e-mail: royal_castle@hotmail.com. Claim to be a three-star hotel although is more like 2. Decent rooms for ₹2000-3500 a night..
31.6215874.8761120 Hotel Sapphire (Very near to Golden Temple), ☎ +91 183 2551478, +91 98 14355344, e-mail: info@hotelsapphire.in. Check-out: 12:00. Hotel with view of Golden Temple. Comfort/Deluxe/Super Deluxe ₹2000/₹2350/₹2650, Executive Room/Family Room/Family Suite ₹3450/₹4600/₹5800 all tax incl..
31.635174.873721 Hotel Shiraz Regency, 3, Queen's Road (500 m east of railway station), ☎ +91 183 5010861, +91 183 5063332, fax: +91 183 5010861, e-mail: hotelshirazregency@yahoo.co.in. ₹2000-6000. Hotel Suncity Towers, 84/15-2, Queen's Road, ☎ +91 183 2229636, +91 183 2229637, +91 183 2229638, +91 183 3296262, fax: +91 183 2222170, e-mail: hotelsuncitytowers@yahoo.com. Rooms: 29. Single/double deluxe ₹1550/₹2000, super deluxe ₹1900/₹2300, extra bed ₹570 all tax incl..
Hotel Teg Royal, Tarn Taran Road, ☎ +91 183 6571516, e-mail: info@tegroyal.com. Three-star hotel with 35 right. ₹1700-5500. Best Western Merrion, District Shopping Complex, B-Block, Ranjit Avenue, ☎ +91 183 5061111, +91 92 16773817, fax: +91 183 2500711, e-mail: fom@bestwesternmerrion.com. Four-star hotel. ₹4000-7500. Country Inn & Suites By Carlson-Amritsar, Queens Road, Queens Road, Amritsar-143001 Punjab, ☎ +91 183 5050555, fax: +91 183 5069696, e-mail: reservations@cisamritsar.in. A four-star hotel with rates starting ₹3000 for double rooms. Better rates online. Free Wireless and breakfast. 1.5 km to the Golden Temple and less than a km to the train station. Very clean and hospitable staff. ₹3000-6500. Green Acres Haveli, Green Acres lies right off the main airport (Ajnala) road, between the Amritsar city and its international airport., ☎ +91 97 819-83828, e-mail: GreenAcresHaveli@gmail.com. 5 minutes from the airport. Set amongst fruit orchards and lush greenery this diamond category farm stay lets guests experience rich Punjabi culture and heritage charm. Recently restored, offers all modern conveniences and provides easy access to Amritsar attractions. Room packages range from ₹3000 to 6000 (inclusive of meals). Holiday Inn Amritsar, District Shopping Complex, Ranjit Avenue, ☎ +91 183 5088888, fax: +91 183 5088899, e-mail: info@holidayinnamritsar.com. Four-star hotel. ₹4000-11000. Hotel City Park Amritsar, Jallianwala Bagh, ☎ +91 183 5003000, e-mail: info@hotelcityparkamritsar.com. ₹3000-5000. Hotel Grand Legacy, 8, G T Road, Model Town, ☎ +91 183 5069991, +91 183 5069992, +91 183 5069993, +91 183 5069994, fax: +91 183 5069995, e-mail: info@goldentulipamritsar.com. Four-star hotel. ₹3000-6500. 31.638274.865522 Hotel Mohan International, Albert Road (near Court road corner), ☎ +91 183 3010100, fax: +91 183 2226520, e-mail: info@mohaninternationalhotel.com. Four-star hotel. ₹3000-6000. Hotel P.R. Residency, 101, District Shopping Centre, Ranjit Avenue, Amritsar-143001 (PB), India, ☎ +91 183-2502666, +91 183 2502999, e-mail: mail@hotelprresidency.com. Located in the most posh area, it has undoubtedly the best rooms and view in the town. Along with the most modern equipped suites, it is a great local favourite for dining for its hospitality and memorable stay. Don't forget to try out Golden Fried Chicken and continental cuisine. Rooms starting at ₹2600 to ₹5000 for suites..
Hotel Ritz Plaza, 45, The Mall, Amritsar - 143001, Punjab, India, ☎ +91 183 2562836-39, fax: +91 183 2226657, e-mail: info@ritzhotel.in. A more classy hotel with good rooms, service and a swimming pool. Price from ₹3500 to 5800. Hotel Sawera Grand, 1724/1, Sawera Tower, Katra Baghian (Back Side R S Tower, Hall Bazaar), ☎ +91 183 2559901-03, +91 8558833441, +91 8558833442, fax: +91 183 2559904, e-mail: info@hotelsaweragrand.com. Rooms: 39 ₹3000-7000. 31.6209874.8788623 Hotel Swarn House, Ajit Nagar, Sultanwind Gate, ☎ +91 183-2580021, e-mail: info@hotelswarnhouse.com. A 3-star hotel. 31.6274.906724 Hyatt Amritsar, Adjoining AlphaOne, MBM Farms, G. T. Road (300 m from SH22 and G T Road intersection), ☎ +91 183 2871234, toll-free: +91 1800 233 1234, fax: +91 183 2871222, e-mail: amritsar.hyatthotels@hyatt.com. Check-in: 14:00, check-out: 12:00. 5 star hotel with a contemporary design, two restaurants, lounge and spa. 248 elegantly appointed guestrooms. Guest rooms: high-speed Internet - wired. Public areas: high-speed Internet - wireless Hyatt King/Pool View King room/Hyatt Suite from ₹4800/₹5600₹/₹10800 (2015 ). MK Hotel, District Shopping Centre, Ranjit Avenue, Amritsar-143001, ☎ +91 9417216190, +91 183 2504610, +91 183 2507911, +91 183 2504611, e-mail: info@mkhotel.com. Three-star hotel, four-star prices. Slightly out of town but a nicer more upmarket option with good service. Doubles from ₹5000, suites for ₹6500 available. Radisson Blu, Anjala Road, 8th Mile Stone, ☎ +91 183 6611111, fax: +91 183 6611122, e-mail: ados@rdamritsar.com. Five star-hotel with 186 rooms. ₹4000-12000. Ramada Amritsar, 117, Hall Bazaar, ☎ +91 183 5025555, fax: +91 183 5025556, e-mail: reservations@ramadaamritsar.com. Four Star Hotel.Rooms : 149 ₹4000-10000. Ranjit’s Svaasa (Welcome Heritage Ranjit's SVAASA), 47-A, The Mall, Amritsar, Punjab-143001, ☎ +91 183 2566618, +91 183 3298840, fax: +91 183 5003728, e-mail: info@svaasa.com. It's opposite the Ebony Mall, down a little side street. The only boutique hotel in town, and a comparative oasis of calm in an otherwise hectic city. Ranjit's Svaasa is set in an old colonial house, and has been nicely refurbished with understated style. The place looks at its best at night. There is also a spa and small restaurant attached. Must be Amritsar's most expensive hotel Rooms starting at around ₹6500 suites for 23000. The sectarian strife of the 1980s is just a bad memory and Amritsar is a safe and welcoming city, if a little polluted. Don't leave cash or any valuables in the hotel room. Cross check all hotel, restaurant and lounges bills for errors. Never pay anyone for anything upfront, including taxi drivers. Do not exchange money in the black market. Ask for a receipt when exchanging money at any authorised currency exchange centre. Inside the complex both men and women are required to cover their heads (scarves are widely available throughout the town for ₹10, or a box of them are free to use at the entrances to the temple). Every visitor is required to remove shoes and socks and wash his/her feet before entering the temple. You can store your shoes at the subterranean building to the left of the entrance. Photography is allowed on the outside ring of the holy lake, but not inside the temple. There are quite a few good internet surfing facilities in Amritsar. Reliance WebWorld and Sify Internet kiosks are located at strategic locations. Cyber Pub, Opposite District Courts on Airport Road. Scanner and printer available. Cyber Swing, (above New Punjabi Rasoi restaurant), has several machines and a decent connection. ₹40/hour. Lahore – Armed with a visa, take the plunge into this bustling gateway city, one of the cultural hubs of Pakistan. This city travel guide to Amritsar is a usable article. It has information on how to get there and on restaurants and hotels. An adventurous person could use this article, but please feel free to improve it by editing the page.